Hyundai will eventually offer an air-bag system that can protect occupants during a second or third collision. Because 30% of accidents involve a secondary impact, Hyundai Motor Group is developing a first-of-its-kind air-bag system designed to improve driver and passenger safety and reduce injuries in accidents with two or more collisions. The automaker did not disclose a target date for when the new air bags will debut, stating only that the company will implement the system in new Hyundai and Kia vehicles in the future. Multiple-collision accidents refer to crashes in which the primary impact is followed by one or more collisions with secondary objects — road signage, electrical posts, or trees, for example. Hyundai's innovation allows airbags to deploy upon a secondary impact by calibrating the status of the vehicle and the occupants. Conversely, air-bag systems presently in use don't offer any secondary protection when the initial impact is insufficient to prompt them to deploy. During a crash, vehicle occupants may be forced into unusual positions — rendering existing safety systems either compromised or ineffective. Multiple-collision air-bag systems are engineered to deploy even faster when the initial safety systems may be ineffective — providing additional protection when drivers and passengers are most vulnerable. 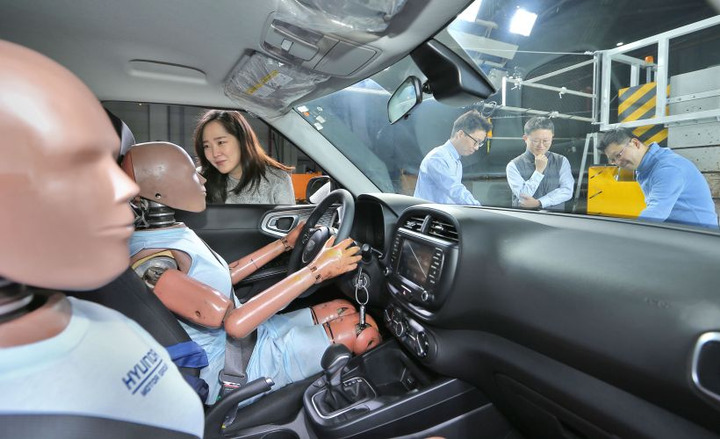 After an initial collision, Hyundai's new technology detects occupant position in the cabin. By recalibrating the collision intensity required for deployment, the air-bag system responds more quickly during the secondary impact — enhancing the odds for fewer injuries and fatalities.